It's been 7 years since my last "real" vacation. So this week I'm off to Germany for almost 2 weeks. The highlight will be 2 separate Fremo events, one on each weekend. I've talked about Fremo before. 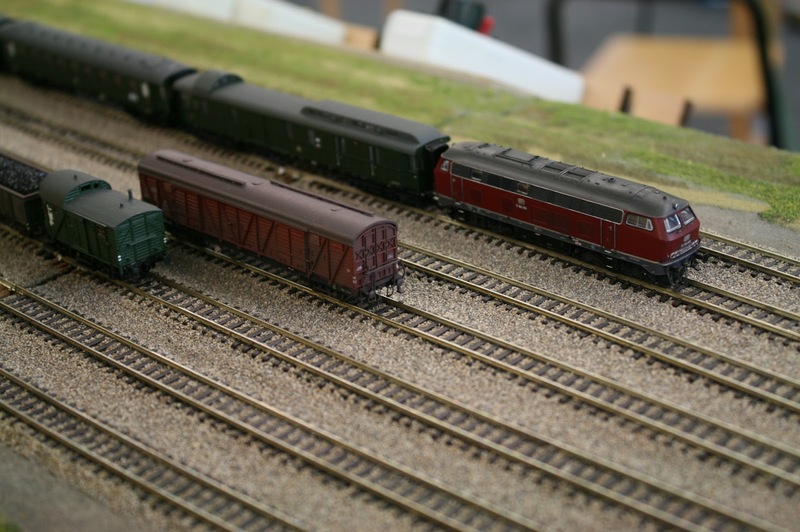 Some of the finest modeling to be found anywhere in a rented room with upwards of 200 members bringing their modules and rolling stock together for a weekend of operations and camaraderie. I fully expect to renew friendships from 2009 as well as making some new friends. We're also planning a day trip to the German Tank Museum in Munster. That'll help assuage my other obsession. I do love looking at tanks! So the shops will be shutdown for awhile, but I'll have lots of photos when I get back . Inspired by the work I'm doing on a couple of Bachmann Consolidations for a client. (A quick repaint and redecal), I dug out my Bachmann Consolidation. My late friend Rich Chrysler had taken one of those very nice models and turned it into a CNR prototype for me. He altered the cab, adjusted a few details on the pilot and substituted a switching tender. I pulled the model out yesterday, considering selling it. But once I saw it again, it brought back many memories of Rich and I knew I couldn't part with it. Now even though I model the Wabash's operation in Ontario, it is all CNR physical plant, thus it is CNRs responsibility to maintain it. 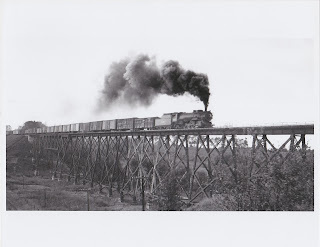 So the plan is to build a work train, pulled by this engine with a few truss rod double sheathed cars and such. So I spend a good part of the morning installing a DSD in the tender. It took a little doing just to get all the bits in, but we succeeded. I fired up the programmer and started that bit of voodoo. When I tried to get the model to move under it's own power, the motor just hummed. Something was jammed. I got the boiler off of the chassis and the reality was revealed! At some point, probably during the move last year, the model was dropped and the white metal chassis is bent. The slots for the driver axles have closed up and are very nicely clamping the axles. As you can also see the 2nd driver is in the air and the cylinders are actually cocked out of position. A quick trip to the Bachmann website shows that they are out of stock for replacement chassis, but I will call tomorrow anyway, hoping that they may have just the white metal part, which is all I need. If you know where one of these parts might be, please let me know. I very much want to get this model running again. We're pleased to announce our latest etched products. Etched ladder rungs in a variety of ladder widths. Our research indicates that car ladders came in a variety of widths, depending upon manufacturer and end user. As a result we are pleased to offer this selection of ladder rung widths which should cover off most needs. The fret includes enough rungs to build 4 ladders and have a goodly amount of spares. Extra long legs are also included for those who wish to use the legs as pins to further secure the ladders to the car sides and ends. I'll admit that when first presented with this design idea I was skeptical, but having built a number of ladders now with these new rungs, I'm sold. You can see these new items on the website, http://www.yarmouthmodelworks.com/details.php , scroll down to just below the ladder stiles. Yes it's been one of those days. I've been working on four S scale cabooses for a couple of guys. Nice kits and they look pretty good once they're done. I had hoped to get decals on the 2 NYC cabooses today. The gods had other plans for me. In fact I had hoped to start decaling the NYC cars yesterday, but when I opened the envelope from the client that contained the decals, much to my surprise they were old CDS dry transfers. So I had to apply a coat of flat finish to the car before proceeding. We let that dry overnight. This morning, upon closer examination, I realized that the decals were not in a sealed plastic bag, which can be terminal for dry transfers. They can dry out very quickly and become near impossible to apply. But the first bit of lettering went on reasonably well, with a little extra rubbing. Awesome! Turn the car over and lets do the other side. A little rubbing and lo and behold the paint is lifting off of the resin. Grumble. Alright then. Plan B. Repaint the car and apply the dry transfers onto decal film. Which in retrospect I should have done in the first place. While that's all drying lets turn our attention to the CNR caboose that needs final assembly. Delicate ladders, fiddly end railings, window glazing, etc. After a few hours we're done. Put it on the shelf and let the owner know that his cars are ready. Lets turn our attention to other projects. While assembling some Sunshine Models boxcars, I get this niggly feeling in the back of my head. Take a minute and it might come to you. The herald is supposed to be under the cupola. Fortunately, I had only used Canopy Glue to secure the roof in place, so it came off fairly easily, with no damage to the ladders. Should have listened to my heart at 8:00 this morning and gone bowling. I'd love to know which railroad owns the first stockcar in this image. I can't make out any reporting marks, but if you zoom in a little, there are some construction features that should help identify this car. The second one is clearly a Wabash stock car. So no comments on that are required. A Shout out for Accurail! Those people at Accurail are pretty incredible. They offer a very nice product at a very reasonable price. As an entry level kit the Accurail cars can not be beat. A nice selection, well executed. even though it's mostly molded on detail, with a little weathering some very credible models come forth. And the option of buying cars with just dimensional data is brilliant. I'm decaling up 18 of these hoppers for a client. He wanted them lettered for his own road, so the dimensional data option was perfect for him. He had custom decals created which made the job much simpler for me. And it's kind of ironic. Just the other day, Monday in fact, I was talking to friend about how nice these models are. A modeler wanting to fill out a fleet quickly with interim quality models, presuming the plan is to upscale to resin later, can't go wrong with the Accurail offerings. Some will remember I used an Accurail Double Door boxcar as a basis for kitbash a few years ago. Accurail is well worth a closer look. There are 3 new items from Yarmouth Model Works to tell you about today. YMW #255 laser cut 40' wooden running boards with laterals and etched braces. After a couple of requests I decided to make these available as separate parts. These are the same running boards that we use in our NP '37 kit and we include etched braces to help solve the pesky lateral mounting issue. These we're quite excited about. Etched from 0.005" phosphor bronze, these items will be a huge leap forward from the fragile styrene or resin straps people have used over the years. By simply soldering a short piece of wire to each end, a very secure and robust method of attaching tanks to their frames will result. These strips will also come in real handy for a large variety of other detailing jobs. Lateral supports, brake step supports, custom make your own sill steps, etc. All of these items will be up on the website, http://www.yarmouthmodelworks.com/details.php later today and inventory is in hand for shipping. What models have you got that have been waiting for just these items?